Full support: Mohamad Aziz holding Azizah’s hand during a meet Barisan Nasional members session at the Parit Raja community hall. BATU PAHAT: Sri Gading parliamentary seat incumbent Datuk Mohamad Aziz who was dropped as a candidate for the coming general election is happy to note that his wife was named as candidate for Parit Raja state seat. “Some people ask me if I will be upset or cry because I have been dropped and my wife will contest instead. “Why should I? Men only cry if their wives die. I have no problem at all. “Those who are faithful to their party will be blessed,” he said during at a meeting with Barisan Nasional members to introduce candidates for Sri Gading at Parit Raja community hall here. 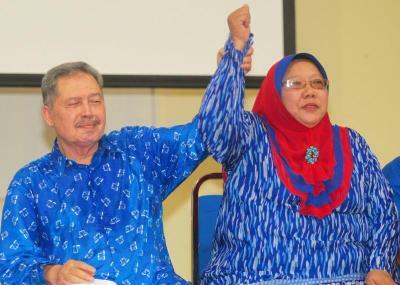 Sri Gading Umno deputy division chief Datuk Abdul Aziz Kaprawi will replace Mohamad to contest Sri Gading, Mohamad’s wife Datin Azizah Zakaria is the candidate for Parit Raja state seat and MCA’s Teo Yew Chuan will be standing in Parit Yaani state seat. Azizah, 58, said it was a complete surprise for her to be chosen as the candidate because her name was not raised during selection of candidates. “I was informed by my husband and his first advised to me is to continue to work as usual. “He will be guiding me during the campaign as I have no experience,” said the mother of 11 children. The Sri Gading Umno Wanita chief also said that she has no problem managing her family and her political career as she came from a family that was active in politics and all her children were grown ups. Abd Aziz said Sri Gading was blessed with its first ever woman candidate for Parit Raja. “Although women candidates are usual in other constituencies in Johor, Azizah is the first here and this shows that the Barisan has high respect for women,” he added. Meanwhile, Teo pledged to work hard and serve the people. “I tendered my resignation as Batu Pahat Municipal councillor on April 15 to give full attention to my new responsibility,” he said, adding that his handphone would be on for 24 hours a day. Teo, the Sri Gading MCA division chief, has been a councillor for 18 years.